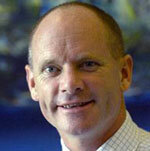 6 September 2010: Campbell Newman is the Lord Mayor of Brisbane, Australia. He was first elected on March 27th 2004 and took office the following month. He was elected for a second four year term in 2008. Brisbane City Council is the largest local government entity in Australia serving a population of 1.04 million people Most city council’s in Australia serve only their core city areas but in Brisbane the City Council administers the majority of the urban conurbation. 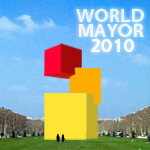 Mayor Newman was awarded fifth place in World Mayor 2010. Power is divided between an executive Lord Mayor and a city council made up of 26 councillors. There is a Civic Cabinet comprising the Lord Mayor and the seven standing committee chairpersons of the Council. Only the Lord Mayor is elected city-wide by all of the city’s 617,000 registered electors. This arrangement makes the incumbent the individual candidate voted for by the largest number of people in Australia. In 2009/10 Brisbane City Council had a budget in excess of $AUD 3 billion. Supporters of Campbell Newman, who is a member of the Liberal Party, describe him as ‘Can Do Campbell’ following his use in both 2004 and 2008 of a ‘Can Do’ campaign slogan. In his first term Mayor Newman had to work with an Australian Labour Party majority on the City Council. Although he made a lot of the difficulties of this arrangement in the 2008 election campaign there had been few high profile conflicts on budgets or policy. The popularity of Campbell Newman was, however, demonstrated as he won 60 per cent of the vote to secure a second term and helped lift the Liberal vote in the 26 council ward contests. The Liberals secured an overall majority with 16 seats. The Mayor’s vision for Brisbane is of a smart thinking and easy living city. His stated priority is to address the heavy traffic congestion in the city by an infrastructure investment programme which will include new roads in tunnels under the centre of the city and enhanced public transport. Dependent on the Federal and State Government’s for finance for some of these, the mayor is finding delivery slow. Nonetheless, road capacity has increased significantly on his watch and this has generated considerable criticism from some sections of the population. Perhaps conscious of that, Mayor Newman has set himself and Brisbane the challenge of introducing “one of the best city cycle hire schemes in the world.” Two months before the scheduled October 2010 introduction of the first phase of the scheme it had already won support and sponsorship from major city centre employers including Flight Centre and RBS Morgans. Mayor Newman has invested his political capital in energy efficiency efforts notably by setting a target for directly sourcing all of the Council’s energy requirements from renewable energy generation. The most recent staging post in this endeavour came in August 2010 when the mayor persuaded Council to back a plan to secure an energy supplier partner who will build a renewable energy plant in the city. The Council is seeking expressions of interest from the market with a view to finalising a 20 year supply contract in 2011. Mayor Newman says that hydro, solar and wind are all options. Mayor Newman has also increased the budget for spending on parks significantly since 2008. The $A115 million allocation in 2010/11 was up 23 per cent on 2009/10 and included funding for new parks, enhanced maintenance of trees and streets and green-space and facilities upgrades in parks. He qualified as a civil engineer at the University of New South Wales and has a Master of Business Administration from the University of Queensland. Campbell Newman served as an engineer in the Australian Army for 13 years retiring in 1993 with the rank of Major. Subsequently, he had two periods as a business consultant, latterly specializing in bulk commodity logistics. In between these periods of self-employment Mayor Newman worked for Grainco Australia where he was in charge of all the company’s operations.